This is Wolf Creek's second earliest opening ever and the first ski area in the country to open this season, according to a release from the resort. KUSA — Ski season in Colorado kicks off this weekend at Wolf Creek Ski Area in Pagosa Springs. The ski area announced its opening day on Wednesday, citing a 20-inch snowstorm courtesy of Mother Nature. The race to be the first ski area to open a lift is a big deal in the state of Colorado. That race is typically between Arapahoe Basin and Loveland Ski Area, but this year Wolf Creek snuck in first. It got buried with 22 inches of wet heavy snow, in a long 6-day storm event It was still snowing at Wolf Creek Thursday night, so they will likely top out close to two feet. “It’s good enough skiing up there that I think people are going to be pleasantly surprised about how much coverage we have,” said Davey Pitcher, owner of Wolf Creek Ski Area. Pitcher grew up the son of ski area developer Kingsbury “Pitch” Pitcher. He said he loves skiing and snowboarding and can’t wait for it to start snowing every year. He said wants to share that with the public as soon as possible. On Oct. 13 and 14, Wolf Creek will open with the Treasure, Bonanza and Nova Lifts operating. They will service ten total runs. This is Wolf Creek’s second earliest opening ever and the first ski area in the country to open this season, according to a release from the resort. That gives them some bragging rights, but Pitcher says he does not consider it winning any type of race. Wolf Creek has pulled off this upset before, opening weekends only on October 8, 2011. Pitcher insists opening early is not about stealing headlines. “Even next week if it’s warm, we got enough snow, we’ll be able to be open again. This isn’t a publicity stunt. We’re open on weekends,” said Pitcher. He also said it’s not so much an announcement for Wolf Creek as it was an announcement for all of southern Colorado and New Mexico returning to better powder numbers. After suffering through a very dry La Nina year, Pitcher likes the prospects this winter. Wolf Creek's average opening date is November 7. He said the so-called ‘Race to Open’ is more about powerful snowmaking operations helping to keep a lift open for the whole season. Wolf Creek does not have a large snowmaking program, just a few guns to keep the lower base area in good shape. “Sometimes we just get lucky with the weather,” said Pitcher. 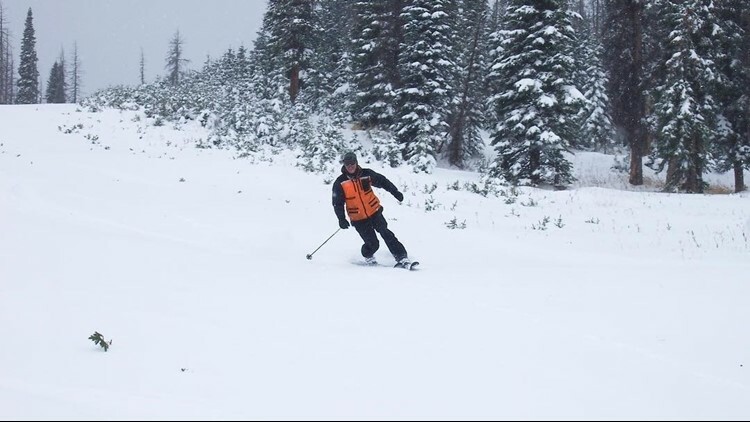 Loveland Ski Area and Arapahoe Basin told 9NEWS that they congratulate Wolf Creek for opening and generating some great early season excitement, but they are both still focused on becoming the first ski area to open for the season full-time. Wolf Creek is open for the season during the weekends only until conditions allow full-time operation. Treasure Stoke, Bonanza and Nova Lifts will be turning from 9 p.m. to 4 p.m. with very early season conditions and obstacles. A Nova Only Lift Ticket with access to Nova and Susan’s runs will be $29 for adults, seniors and children. Access to all three lifts will be at the Local Appreciation rate of $50 for adults, $33 for seniors and $27 for children.